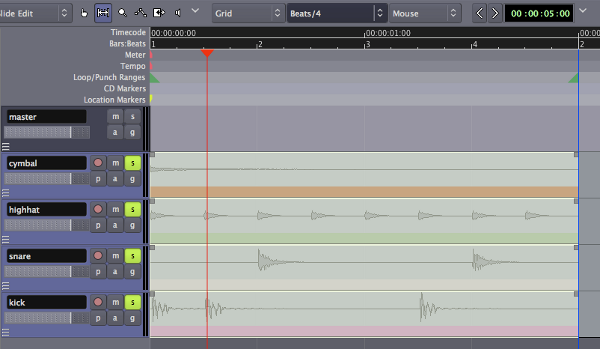 You can easily repeat sections of audio in your Ardour session. 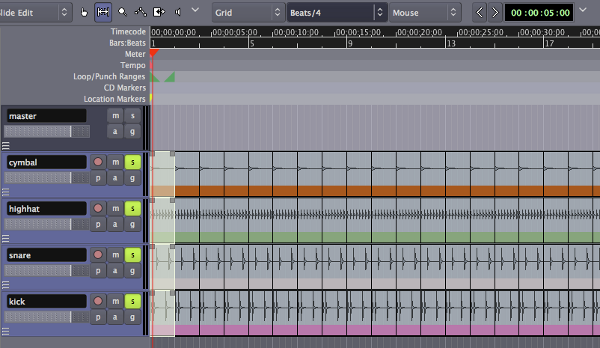 Here, we take the short rhythmic passage we created in Working with Regions and duplicate it to make a loop. When you've arranged your Regions into a single "loop cycle" and you're satisfied with the sound, you're ready to create a Range with all the regions that will make up the loop. First, make sure every Track used in the loop is selected. Unselected Tracks are gray, and selected ones are blue. If any of the Tracks you used are not selected, hold down the Shift key while clicking on them to add them to the selected group. Finally, use the Range tool to select the entire loop. Once again, the Grid setting will help you to set the range precisely to the start and end points of your metric bar. 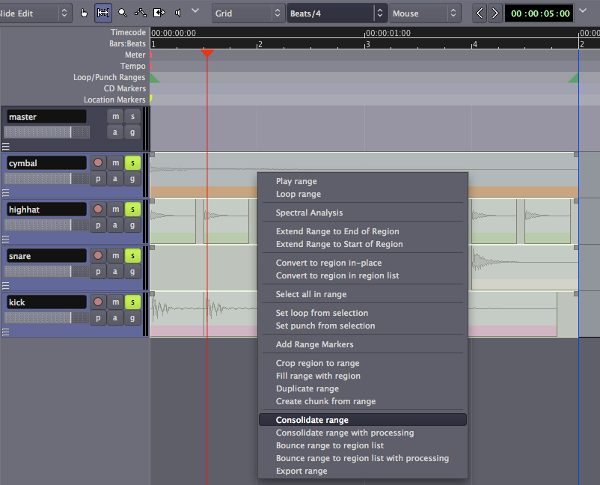 Once you have the entire loop selected, Right-Click on the range and select "Consolidate range". If you would like any Automation or Plugin effects you have added to the loop to be included, select "Consolidate range with processing". When the range is Consolidated, new Regions will appear in each Track, each containing all the repetitions of the samples which you set up in the previous steps. Previously, we learned to Duplicate the Regions one at a time and one after the other, by using the "D" key. Now, with all the Regions in the loop still selected, we can go to the Region Menu at the very top of the Ardour window. Here, we have the option to Duplicate Region as well, but there are also two more choices. 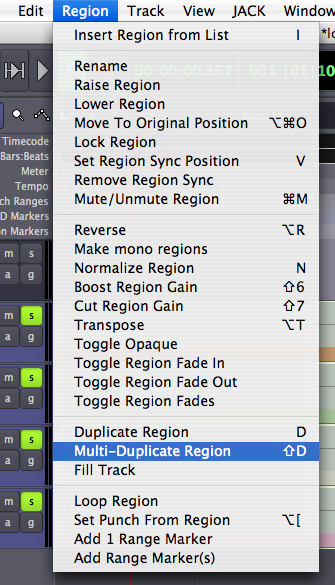 If we want to duplicate the selected regions more than once, we can use the Multi-Duplicate Region menu item to choose how many duplications, or use the Fill Track menu item to duplicate the selected regions all the way to the End marker of the session. In the Multi-Duplicate Region dialogue, we enter "20" for the Number of Duplications. 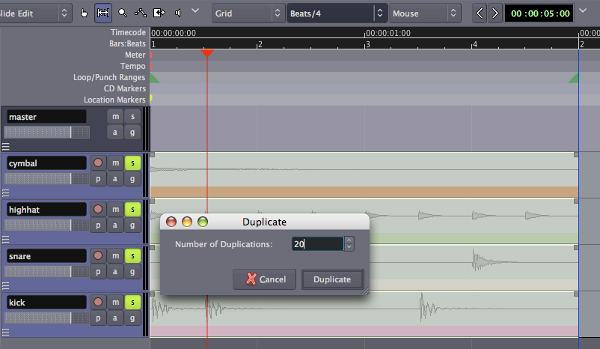 And when we click Duplicate twenty identical duplications of the Regions we selected will appear, one after the other. In the next tutorial we will learn about Stretching/Shrinking Regions that are longer or shorter than one Bar in order to fit the rhythm of our passage.